Ospreys have colonised Northumberland for the first time in more than 200 years, say conservationists. A pair of birds has settled on a specially-built platform near Kielder Water, Europe's largest man-made lake. The female is thought to have been incubating eggs, which may have recently hatched, according to the Kielder Partnership. 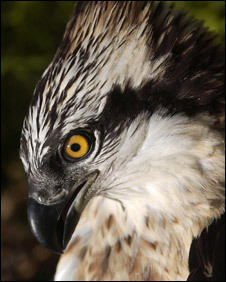 Accounts from the 18th Century refer to "fish-eating hawks", but there are no records of ospreys in the county since. The birds were enticed to the area, on the north shore of the lake, with the help of four wooden artificial nesting platforms, and it is hoped that if they successfully breed they will return in future years. Experts believe that changes in the behaviour of the birds indicates that eggs have hatched. The female had been spending long periods on the nest, possibly incubating eggs, but is now much more active, said a partnership spokesman. The male is also making more frequent swoops over Kielder Water to hunt for trout. Tom Dearnley, Forestry Commission ecologist, said: "Kielder Water and Forest Park have been on the flight path of migrating ospreys for some time. "But in recent years birds have been seen more frequently, prompting us to erect the nesting platforms. "Our chief goal now is to help the birds rear their family as they are probably first time parents." The ospreys will be constantly monitored by ornithologists and wildlife rangers. Mr Dearnley added: "It will be a tremendous feeling if the young ospreys make it - the first born in Northumberland for centuries." Ospreys were once common in Britain, but they had been hunted to extinction in England by 1840 and in Scotland by 1916. Some birds re-colonised Scotland in the 1950s and today there are about 200 pairs. They have recently re-colonised the Lake District and have been introduced at Rutland Water in the East Midlands.